A list. With things crossed off. oooh weee that feels s'nice! 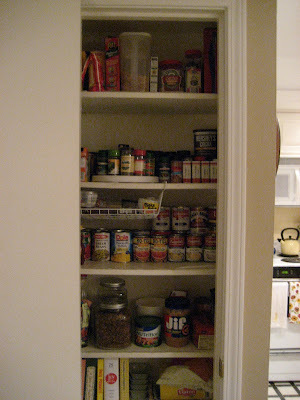 Before I get to the vignettes, indulge me through the pantry-cleaning-out process. and bt-dub, this is NOT the first time I've cleaned out the pantry...just (apparently) overlooked a few things in the past. Two containers of garlic powder? Just silly. ...especially when one of them is dated 11/03 (you can see it upside-down on the right side of the trash can). Why did I think when I took this picture, "Ah, America!" ??? Crummy picture of the finished/organized product, if you will. Then onto the fun stuff. For this next little series of photos, none of the contents are newly purchased or acquired. I had all this stuff already; just put it in different spots/groupings. yeah, me too. i heart them in a major way. [and was sooooo lucky/excited when three different people gave me one for Christmas!] they have found a new home atop my painted dresser. Next, I was a big girl and got out my silver cream to clean up this guy. Should've taken a before picture, but just imagine an almost-black silver pitcher. with Sister's bouquet from my wedding in it. The little colored plates are from an estate sale, as is the pitcher itself. yes, I put my Kitchenaid in the [cleaned-out] cabinets below the counter. But it does look a lot more spacious and less cluttered. vampire though I am, this photo + all this cleaning does make me long for spring! Hate to be a Debbie Downer, but did you recycle that can with the beans in it? That would be a major recycling fail...Oops. 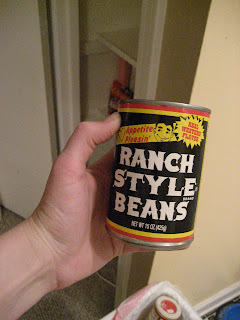 did you see where I said "[and yes, I did take the ranch style beans can out and recycle it. 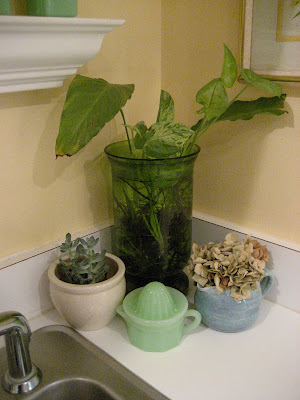 we recycled everything we possibly could.]" Nice work sis, and you did it all on your own. This is very impressive, I'm so proud of you. Don't you love a new seasonal vignette? I also spent part of my weekend Spring-ing up my place - feels so good! impressive, my friend! don't you love going to the grocery store now and coming home to store the loot? oh, thats the best feeling. Everything looks great! That jadite citrus reamer is darling. Love me some Fire King! I'll answer your question, Katie. We did empty out all contents prior to recycling the containers. I wonder how long that futon mattress will stay in your attic? I wouldn't dare move it either! Its half Grants fault too. He helped me put it up there.